Carriage Mount Drum Racker - 12V DC Power Tilt, 800 lb. Cap. The carriage mounted drum racker aids safety when inserting or removing horizontally stored drum in racking. Even lift vertical drums and rotate them to a horizontal position for placement in rack. 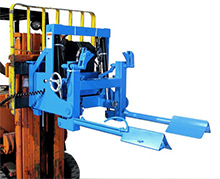 To operate, manually clamp the upright drum into the holder using the hand crank to secure the drum, then lift and tilt the drum to a horizontal position. Once drum is in the rack, release the clamp and back out of the racking. Applies to ITA Class 2 forklift carriages. Tilt action is controlled through a hand-held cabled controller. Includes self-contained 12V DC powered hydraulics, 12V deep cycle battery and charger. Horizontal drum storage offers two major benefits: stable off-floor storage and easy dispensing from the rack. But, getting drums into and out of the rack can be back breaking labor without the right equipment. That's where a drum racker is a real time and back saver. Operated completely from the fork lift cab, the drum racker lifts, rotates and inserts or retrieves drums. 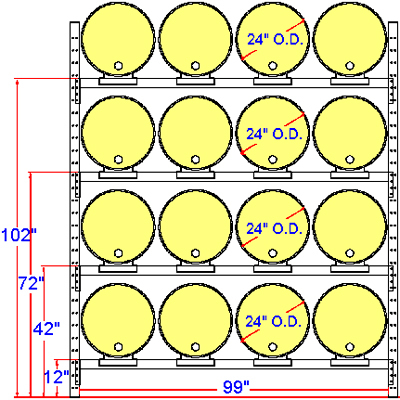 For proper horizontal drum storage, consider a rack layout like that shown below. This arrangement keeps all drums off the floor, provides adequate yet safe spacing between drums based on an average 24" drum diameter. WARNING: This product can expose you to chemicals including cobalt metal powder and titanium dioxide which are known to the State of California to cause cancer. For more information – www.p65warnings.ca.gov.